Consider establishing a scholarship in your name, the name of your business, or in honor or memory of a loved one. You can also make an unrestricted gift to support our work in any amount. These gifts might be used for such things as postage, assisting graduating students with scholarships or assistance with scholarships, or for sponsoring the annual Senior celebration honoring Sisters High School students’ achievement, to name a few. You can also make volunteer or in kind contributions thru ASPIRE. Every contribution will be put to good use by our all-volunteer organization. Sisters GRO is a 501(c)(3) charitable organization and your contributions are tax deductible to the full extent of the law. Sisters GRO accepts donations from individuals, foundations, and business organizations. Your donation will enable Sisters GRO to give Scholarships to Sisters High School Students and help pay for other costs. You can donate to our general expense fund, Endowment for Dreams Fund, designate your gift for a specific scholarship, or multiple scholarships (see list of scholarships here). You can use the Donate Button below to make a donation via PayPal using your PayPal account or credit card. We welcome pledges, payable to fit a convenient payment schedule for you. We accept gifts of publicly-traded securities. You may deliver the securities to your broker requesting him to contact our office for further instructions, or you may contact us directly. We accept gifts of Good and Services, please contact us for more info on these types of donations. 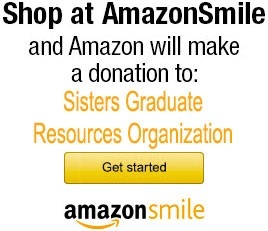 Please consider naming “Sisters Graduate Resource Organization, P.O. Box 1546, Sisters, OR 97759” as the beneficiary. Please specify “Sisters Graduate Resource Organization, P.O. Box 1546, Sisters, OR 97759.” We will be pleased to provide your legal or financial counsel with additional information upon request. These gifts memorialize a loved one or honor and recognize a special friend, family member or mentor who is still living. Click on the “Get Started” button to go to Amazon.com.